NJ Transit said upcoming Amtrak track work at New York’s Penn Station will impact peak service for riders on some trains on the Northeast Corridor and the North Jersey Coast Line. The work, which is scheduled from Jan. 8, 2018 until the end of May, will affect five trains per day – two trains in the morning peak hours and three in the evening peak hours. One Coast Line train will be diverted to Hoboken in the morning and evening. A NEC train in morning and evening will terminate and originate at Newark Penn Station and another Coast Line train in the evening will be canceled. Three tracks at Penn Station are going to be taken out of service this winter, giving many LIRR riders anxiety. Greg Cergol reports. The NJCL 6:11 a.m. eastbound train will now depart at 6:23 a.m. and be diverted to Hoboken. The NEC 7:06 a.m. eastbound train will terminate at Newark Penn station. 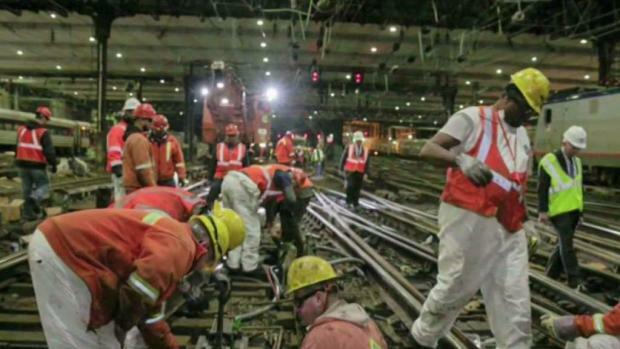 Three evening trains affected are: NJCL 5:25 p.m. from New York Penn will originate from Hoboken at 5:22 p.m; NEC 5:43 p.m. from New York Penn will originate at Newark Penn Station at 6:03 p.m.; NJCL 6:51 p.m. train will be canceled. Other trains may have adjustments made to the timetable or station stops.